Nearly everything information-wise has been released about the Dodge Demon so far apart from pricing. 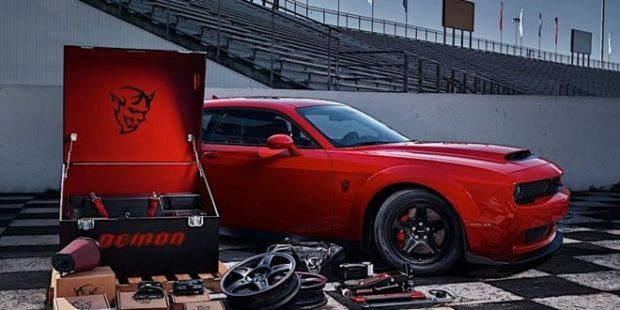 Now, the 2018 Dodge Challenger SRT Demon including the gas guzzling tax, Demon Crate additions delivered to your door will be $86,093 MSRP. The gas guzzler tax adds up to $1700, with the destination cost being $1095, with the Demon crate and front passenger seat, only adding up to an extra dollar. Considering you are getting the most potent muscle car currently available and the Demon create individually costing around $6140, this is a prize package for the price. There is a Leather Front Seat Group which adds things like upgraded seating, heated steering wheel, finish paddles and premium formats for $1,595. Red seatbelt upgrades come with a pricetag of $195, a satin black hood costing $1,995 and a satin black graphics package costing $3,495. If you want the full barrage of options this will set you back $97,273, just under the predicted $100,000 mark when launched. There is no indication as yet to how the 3000 Demon’s will be allocated, but the car will go on sale this fall. IF you save for long enough you never know!